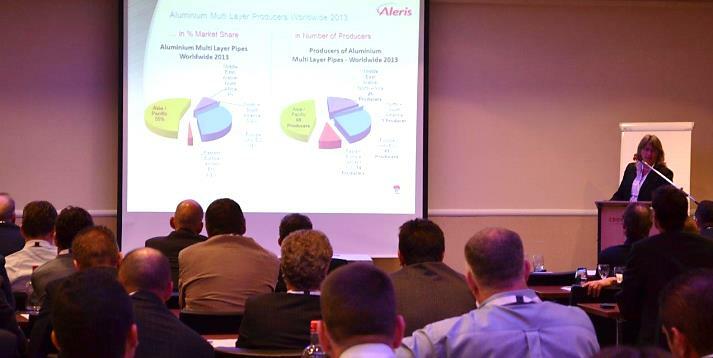 More than 80 participants attended the Aleris Multi Layer Tubing Days. The seminar lectures and discussions extended over a broad spectrum of topics: From the aluminium as a raw material over the multi layer pipe markets to the production of the aluminium foil. KWD-globalpipe, 11.12.2013. The well-organized Aleris Multi Layer Tubing Days took place in October 2013 in Antwerp /Belgium. More than 80 participants from different countries came to hear the speeches and to discuss about the multi layer pipe markets. The conference was a big success and participants used the get-together that followed for a lively exchange of opinion and experience in a relaxed atmosphere. Aleris promised to take this event as a start for a tradition. So hopefully in two years we shall meet again at Aleris. In the following issues of KWD-globalpipe we will give a summary of the speeches. In this issue we will start with the part “Aluminium, construction and pipe market”.